The gravity sensor measures the force of gravity applied to the sensor built-in into the device and provides a three dimensional vector indicating the direction and magnitude of gravity (in m/s²). 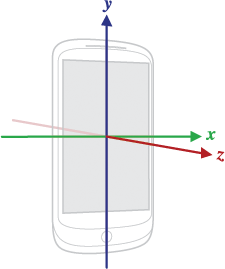 When a device is at rest, the gravity sensor should measure equally as the accelerometer. Aware_Preferences.STATUS_GRAVITY: true or false to activate or deactivate accelerometer sensor. Aware_Preferences.FREQUENCY_GRAVITY: non-deterministic frequency in microseconds (dependent of the hardware sensor capabilities and resources). You can also use a SensorManager sensor delay constant. Gravity.ACTION_AWARE_GRAVITY: new data recorded in provider. Gravity.EXTRA_DATA: the recorded data, as ContentValues. Gravity.ACTION_AWARE_GRAVITY_LABEL: assign label to the recorded data.